“Who wants to go for a car ride?” In our house, that question gets Oz to the front door in a matter of milliseconds. While some dogs may not enjoy a car ride, other dogs like Oz think it the best thing ever. But what is it exactly that makes some dogs love a car ride? I don’t know for sure but I have three good guesses. 1. It’s an Adventure. Most dogs love a good adventure whether it is a visit to a park, a hike in the forest or a car ride. Car rides can be a great adventure for some dogs – its unpredictable, its time spent with “the pack” and it offers the opportunity to discover new places. 2. New Scents to Smell. With their amazing sense of smell, dogs can explore new places just by taking a deep inhalation. Crack the window in the car as you drive and your dog gets to explore not just the destination but the entire journey. 3. It Feels like a Hunt. OK, this one I found while doing some background research and thought it was interesting enough to share. Kevin Behan at Natural Dog Training believes that dogs love car rides because it produces the same feelings as being on a hunt. According to Kevin, dogs hunt by feel and the synchronized movements of “pack members” within the vehicle mimic the pack moving in sync as they jointly hunt prey. He also theorizes the objects the vehicle passes appear to move quickly which can trigger a dog to give chase. Honestly, I sometimes think Oz loves a long car ride because he can get in a good nap! Without fail on long road trips he is heard snoring from his spot in the back seat. But, no matter what the reason a dog loves a car ride, please make sure your dog is safe while in the vehicle. 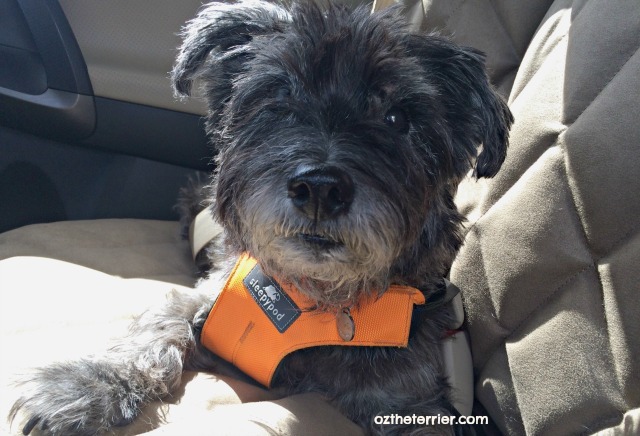 For the past three years, we have kept Oz safe during car rides with Sleepypod, first with the Clickit Utility harness and now with the Clickit Sport harness. We are confident Sleepypod will keep Oz safe if we are ever (dog-forbid) in an accident. And not just because all Sleepypod products are crash-tested and certified by the Center for Pet Safety…but because Sleepypod has actually saved the lives of pets involved in real-life auto accidents. Sleepypod’s safety record is no accident. Sleepypod customers have reported multiple auto accidents without injuries to pets using one of their carriers or harnesses. You can hear one Sleepypod customer’s accident without injuries report HERE (warning: it makes me tear up so be ready). 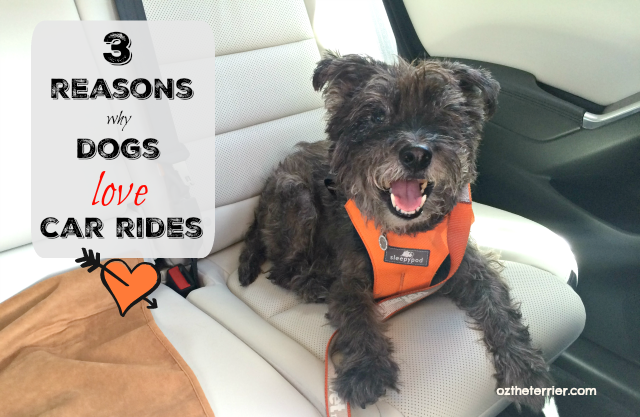 Does your dog love car rides? How do you keep your pet safe while in the car? I don't know about the dogs, but a car ride gets me out of my cage. Ruby's all about car rides, too. Very interesting about the hunt theory. I think Ruby just loves to be included and part of the adventure and pack. We need need a new car harness for her and will definitely check this out. Jessie and I love the car! Mostly because it means we're going somewhere FUN! Poor Pigeon hates them. She cries the whole time in her carrier. Not a fan of the car ride. I don't mind driving slow like through town but highway speed makes me nervous and I hide my face. Hi, my pug loves car rides, we take him with us at least twice a week, and the kids have so much fun every time. Thanks for sharing! I get over excited when riding in the car cause I know I am going somewhere fun! Bella hates the car and only puts up with it to get somewhere to walk and be with the group. But Roxy and Dui love barking at other dogs and watching the world go by! We always feel bad for those dogs who only get a car ride when they go to the vet. For us, it is always an adventure and we don't know where we are headed. Our boys love going on rides because it means a new adventure! They ride in their kennel in our SUV. I don't blame you one bit for sleeping on a car ride, got to rest up for the big adventure after the ride. I rrruff my car rides! This is timely, because the head prep was just asking the grand prep about this yesterday. His poodle loves car rides, and we cans imagine why. We are working on his safety awareness now. Old grandpeeps have a hard tie learning new tricks.